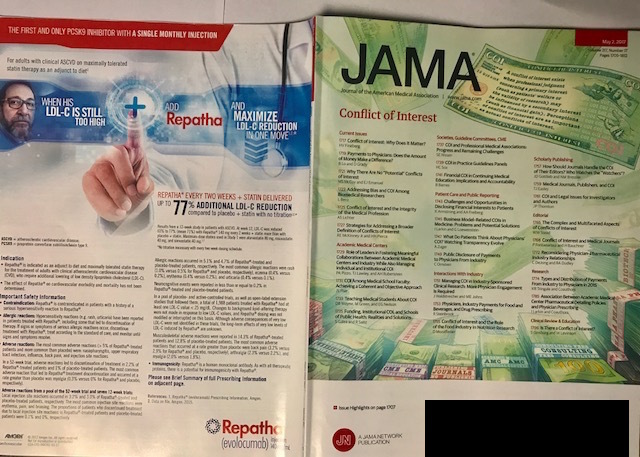 In the May 2nd issue of the Journal of the American Medical Association (JAMA), the American Medical Association (AMA) discusses the subject of physician conflicts of interest in medicine. This puts them at an interesting juncture when the editor-in-Chief and executive editor of JAMA failed to disclose their relationship with the AMA and the AMA's relationship with US physicians. The AMA still presents itself to the public and legislators as representing Americas' doctors, even though representing US physicians’ interests has not been their financial priority for many years. In fact, it is telling that their mission statement no longer includes the words doctor or physician. If they do represent US physicians as they often claim, then the AMA (and its publication JAMA) are rife with numerous conflicts of interest and public clarification of this fact is desperately needed. In June 2016 at the invitation of the Pennsylvania Medical Society, concerns regarding the conflicts of interest inherent to the American Board of Medical Specialties’ (ABMS) Maintenance of Certification (MOC) program were brought before the interim national AMA House of Delegates meeting. The AMA and ABMS are co-member organizations of the Accreditation Council for Graduate Medical Education (ACGME) and each organization took interest. The room was full of concerned physician delegates who had taken time away from their practices to represent their colleagues, alongside the President and chief council of the AMA, senior executive officer of the American College of Physicians, and the President and CEO of the ABMS. These courageous practicing physician delegates issued a “vote of no confidence" in the American Board of Internal Medicine (ABIM) - the largest ABMS member board representing approximately 200,000 US physicians - during a national panel discussion. They later passed a resolution to end the ABMS MOC program, which is a laborious recertification process plaguing overburdened physicians across this nation. Unfortunately, the AMA leadership has yet to honor this resolution. If the House of Delegates is little more than a figurehead that makes a mockery of representing practicing US physicians before the AMA, then the public, legislators, and participating physicians should be formally notified and the perceived conflict clarified. Likewise, when a physician notifies JAMA's Editor in Chief of ABMS authors that have consistently failed to disclose their affiliation with their own for-profit wholly-owned subsidiary ABMS Solutions, LLC in JAMA and elsewhere, a response and action addressing this specific conflict should occur. However, if the AMA has chosen to serve as an independent business entity paying their journal's editor-in-chief (who also serves as their Senior Vice President) $687,290 while also earning $111.1 million from CPT code “royalties and credentialing services” and $20 million from advertisers, then there is no conflict and the editors can feel reassured their disclosures in JAMA were proper. The AMA is one of the largest nonprofit 501(c)(6) business leagues in the country and has accumulated assets of over $686 million for its purposes. The AMA has a solid history of racketeering all the way back to 1937 when they violated the Sherman Anti-Trust Act. Did you know that the AMA ran an "offensive" corporate operation called the DoI investigating healthcare practitioners with the aim of controlling healthcare markets and shutting down those they considered to be engaged in irregular and even fraudulent behavior in the practice of American medicine. The 1937 indictment against the AMA for racketeering was partly connected with this investigatory department and its overreach. AMA's investigatory branch was called the "Department of Investigations". The DoI was responsible for shutting down a lot of competition practicing naturopathic medicine. They went after homeopathic physicians, naturopaths, chiropractors, indigenous American native healers, and others utilizing European, African, and Asian traditional remedies. The DoI started secretly in 1906 and was officially announced several years later in 1913. The operations were terminated and the department abolished for good reason in 1975. Many opponents of the AMA methods and practices are very vocal online and many still associate the AMA as racketeers trying to monopolize healthcare. Profiting from the Physicians' "Master Profile"
AMA Physician Master Profiles appear to be rife with conflicts of interest. Partnering with the ABMS, NCQA, ACP, ACGME and others to profit from keeping physicians indentured in the ABMS MOC program is clearly classic racketeering and in violation of anti-trust laws. With whose authority is the AMA selling physicians' personal data and information? What laws does this violate? What happened to privacy? I did not give them permission to do this with my data. After your account is created and your organization is approved, you will be able to add users to the account and purchase profiles. Learn more about adding users to your organization’s account." The AMA and JAMA were supported by cigarette ads/propaganda for decades. "The smoking physician had become a visual oxymoron"
The AMA sold the physician image on behalf of the Tobacco industry. Physician images were utilized as "wise judge" of which brand was better and to promote cigarette smoking as a healthy activity. As one can see by the touched up photos of smokers in the countless advertisements they are all glowing with health and the center of attention. The AMA and JAMA, even after evidence of the deleterious effects of tobacco use were published, still aligned themselves with their "income sources" to help the tobacco industry keep the debate alive. They clearly did this in order to protect the industry and sustain the income derived from deceiving the public. In 1954 a physician wrote an editorial pointing out the unethical way the AMA (JAMA) was using physicians images in print and how tobacco agents were soliciting support and "bribing" the AMA at conferences. The NEJM is cited in the study as an offender also. Do the ABMS executives and officers cheat on their own MOC examinations? It's time for Dr. Baron to start cramming again for his 10-year recertification test. You know that onerous 10-year recertification exam that Dr. Christine Cassel was required to do to maintain her geriatrics certification. Yes, the one she decided not to do as she no longer was required as an officer and executive of the ABIM. Will Dr. Baron take the Geriatric Medicine 10-year exam in 2018 or opt for the 2-year exam cycle when his ten years are up in 2018? Will Dr. Baron go to a Pearson View testing center in Philadelphia, as is required for all, or does he get to take the test like usual at the ABIM offices during work hours? Does Rich Baron get to use his 35-hour work week for study preparation? Has Baron seen any of the questions? How does that work when you work for an ABMS medical board and as an MD are required to take the test with all that insider knowledge. Aren't the questions "put to the test" by the staff and executives? Don't try to tell us that the ABMS insiders don't cheat, because we all know better. Has their been any studies of failing CEO's done by the ABIM or any other medical board? They seem to have had a lot of them running the organizations into the ground. What certification test do they take for good stewardship? And where are the studies about the actual cheating that I understand takes place among the ABMS insiders "talking among themselves" or "sharing questions" in the course of preparing for their own tests. I mean the ones who are required to take the mandatory MOC exams - which is every one of them. What does that do to an executives self esteem when they (ABMS execs, etc.) and everyone else knows the execs and board directors have cheated - even if it's only on one, two or three questions that floated by their ears in a meeting or exam committee? Actually it will be exponentially many more that they were exposed to than that. I reflected on these things when I came across an old NY Times article this morning. I thought What a messed up world we live in that requires physicians to take a MOC exam because they (ABIM/ABMS execs) have cheated on their finances, lied of tax returns and self-dealt their way to personal excesses most people would have an emotional meltdown of remorse about. How much of the actual ABMS overhead goes into the pockets of executives? Let's hear those outrageous numbers again! And let's see those insiders' testing receipts from the Pearson Vue testing centers. I am skeptical based on direct evidence of repeated misconduct and repeated lies and propaganda emanating from the ABMS member boards like the ABIM. There is a high degree of confidence that an objective audit would turn up massive testing fraud among the ABMS insiders. But like all the other scandals they will bury their heads and say nothing. What else can they do or say when everyone knows they routinely have their hands on physicians' fees spending it all on themselves and extracurricular expenses as they please. ABIM's Knowledge Check-in every two years at a testing center will be much worse - far worse - than the onerous ten-year exam. More travel and expense. More time away from practice more often. More stress. If you take the test at home you have the additional burden of paying for compatibility upgrades constantly, making your home or office free of contraband materials, and submit yourself to a poorly vetted third-party company taking control of your computer (making changes to it) plus keeping video and data files on you. More chances for sanctions and lawsuits claiming you violated any of the sundry ABIM/ABMS policies and pledges that are part of your signed legal contract. This ABIM/ABMS contract as it changes every year/or periodically will open you up to civil and criminal prosecution and potential loss of certification status. Buyer beware. More fear equals more control over physicians. "My certification is due to expire in 2017 but the ABIM Knowledge Check-In will be available in 2018. Can't I just wait and take that? All physicians with certifications that expire before the ABIM Knowledge Check-In is offered in their specialty will still need to take and pass the long-form assessment (ABIM’s 10-year exam) in order to maintain their certification. Once you pass the long-form assessment, you will have 10 years before you need to take another assessment." Again it's not about protecting the public but about the Rich Barons of the world protecting their bottom lines, defending cushy jobs working at home in their bath robes, but especially rich barons of the ABMS fortifying their big fat bank accounts. An interesting observation from a well-established journalist about troubling historical/current affairs and how a shadow government (the entrenched and embedded unelected bureaucracy) plays into/relates with the extremely heated, confusing and contradictory politics we see today in DC. The healthcare field/medical industry can perhaps find some parallels in the underlying issues of why the hidden battle for money and power is being waged. Harmful and redundant MOC is; MOC hurts the physician and patient force it does. Abundant are the reasons to oppose MOC; none are the reasons to go over to the MOC side. Only greed and evil false power it is. Give not in to the MOC side. I would like everyone to know that today will probably be a pivotal day in the anti-MOC fight. Through the efforts of hundreds/thousands of doctors all across the state of Texas - the Texas House will be considering the anti-MOC legislation today. It was sent through the Calendars Committee over the weekend - and the final stop will be today in the House Chamber - and then hopefully on to the governor. As everyone may know already this legislation has been already passed UNANIMOUSLY by the Texas Senate - Democrat and Republican alike - a feat unheard of in this highly polarized state in this highly polarized year. I expect a similar outcome today in the House - as long as there are not any unforeseen political shenanigans - and shenanigans are at lease somewhat likely given what has been going on down there this session. If the state of Texas does do this - it will be a monumental step in this anti-MOC process. I am an internist in a major city - I know not a SINGLE colleague in any specialty who plans on participating in MOC going forward. I am not sure how the ABMS member boards survive financially going forward - when big states like Texas and Georgia (who just passed anti-MOC legislation of their own) allow their docs to pull out. As an aside - I was not present in the committee hearing - so I do not have first hand knowledge. However - I was told that the representative the ABMS sent for their side at the hearing was just absolutely arrogant and really offended multiple legislators. Sending an arrogant "Yankee" and their fancy book-learning to tell people in Austin "how it is done" - is certainly not the way to influence Texans. It is a bit depressing to me that these groups are using our money as physicians to lobby for us - and this incompetence is what we get. Wes - again - cannot thank you enough for you honest appraisals, your courage - and your willingness to go the extra mile for the ethics of your profession. We all owe you a debt of gratitude. Here is hoping that all works out well today in Austin. REMEMBER THE ALAMO!!!. "Sending an arrogant "Yankee" and their fancy book-learning to tell people in Austin "how it is done" - is certainly not the way to influence Texans"
I enjoyed reading this statement, and laughed out loud! If true, the ABMS demonstrated cultural insensitivity, suboptimal "people" skills, and ignorance about the people of the great state of Texas. I am a "Yankee" that resided in Texas during my residency and fellowship days. I quickly learned that a dose of humility along with the respect of others culture, values, and traditions is the formula for success. I will be retiring soon, and look forward to moving back to Texas near my Texan children and grandchildren near northwest Austin. I too hope that all works out well today in Austin for the anti-MOC forces. And it is true that the "Stars at night, ARE big and bright; deep in the heart of Texas!